Listed developer Mirvac has secured financial services group Suncorp as its major tenant for a new $836 million Brisbane office building at 80 Ann Street. Along with the 10-year pre-commitment from Suncorp, Mirvac has also closed a deal to build the tower with M&G Real Estate, which will own a half stake for $418 million, reflecting a yield of 5 per cent. Suncorp's chief executive Michael Cameron said the move was an opportunity to bring Suncorp's teams in Brisbane together into one location, creating efficiencies. "The new workplace will reflect Suncorp's Queensland heritage, with a design that is focused on our people and their experience..."
Mirvac's chief executive Susan Lloyd-Hurwitz said her team had worked closely with Suncorp over a number of months, as well as the architects on this project, Woods Bagot. "We have been able to provide Suncorp with a superior, bespoke workplace solution that meets all of their strategic objectives," Ms Lloyd-Hurwitz said. "This premium office development reinforces our unique asset creation capability, and further adds to our young and modern $2.3 billion office and industrial development pipeline." 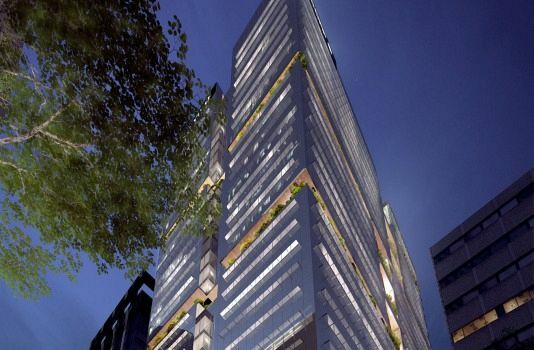 Suncorp's lease will make up about 66 per cent of the premium-grade tower's total space of 60,000 square metres. M&G will also fund 50 per cent of the development costs using a fund through agreement throughout the construction period while Mirvac will provide development and property management services for the building. Mirvac will pay M&G a coupon rate of 5.25 per cent throughout the construction period. JLL's Seb Turnbull and colleagues Luke Billiau, Paul Noonan and Stuart McCann negotiated the transaction with M&G Investments for Mirvac. "The investor response to 80 Ann Street was extremely pleasing and was a testament to the best in class building design, quality tenant covenant and the partnership that co-ownership with Mirvac offers," Mr Turnbull said. "Core investment offerings like 80 Ann Street are rare in Brisbane and the investors jumped at the chance to participate." Architects Woods Bagot will design the 31-floor tower which will boast Brisbane CBD's largest floor plates when completed and new retail amenities on the ground floor. The tower due for completion in 2022 will also have a 6-Star green star, a 5-Star NABERS energy and a 4-star NABERS water rating. Mirvac acquired the 5500sq m site between Turbot and Ann Streets adjacent to Brisbane City Hall from Singaporean group Wee Hur for $79 million late last year on a put-and-call option. Settlement is due in early 2019, subject to Foreign Investment Review Board approval. Brisbane remains one of the country's weakest office leasing markets with a vacancy rate of almost 16 per cent, according to the Property Council's Office Market Report, though many believe it has bottomed out providing new acquisition opportunities for asset owners. In the same part of the Brisbane CBD, the Singaporean government's sovereign wealth fund, GIC, purchased Santos' headquarters at 32 Turbot Street for $370 million last year.